October is National Breast Cancer Awareness Month and Eden Energy Medicine (EEM) techniques can make a big difference in breast health at many levels. Not only can EEM be important in breast cancer prevention, they can also play a role in addressing cancer and coping with chemotherapy. The lymphatic system in your body (pp. 47-51) plays a key role in helping to counter conditions that can lead to illness, ranging from colds to cancer. Rubbing the Neurolymphatic Reflex Points (Figure 2-4, p. 50) sends messages to the lymphatic system, helping to release toxins into the bloodstream so they can be eliminated from the body. The use of underwire bras can stop energy flow and clog the Neurolymphatic Reflex Points located around the breasts. This can harm the lymphatic tissue in the breast itself. Energy and lymph naturally move through these areas, but this movement may become blocked for many reasons, including the use of an underwire bra (both metal and plastic underwires have this impact). Clogged energies and physical tissues can create pain and an internal environment that invites future health problems, including cancer. Rubbing the lymphatic points around the breast is a great tool for promoting breast health and preventing the stagnation caused by the wire in your bra. In fact, in Donna's classes, she recommends that all women wear bras without underwires. For a list of wireless bras, click here. 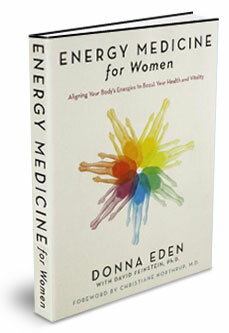 Note: Page numbers reference Donna Eden's book Energy Medicine for Women (Tarchar/Penguin, 2008).